The Tyne Theatre & Opera House on Westgate Road in Newcastle is one of only twenty three Grade I listed theatres in the UK. The beautiful interior dates back to when the theatre was first built in 1867 and I cannot imagine a better setting to fully launch myself into the festive season whilst watching the touring stage musical 'Miracle on 34th Street'. Miracle on 34th Street has to be up there as one of my absolute favourite festive films and I love both the original and the remake in equal amounts so I was curious to see how the show would be transferred to the stage. The audience were transported to the streets of New York during the show and at times I really did believe I was shopping in Macy's department store rather than sitting in a theatre. The story follows the tale of Kris Kringle and aims to capture the magic of Christmas by proving to all non-believers that Santa Claus is in fact real. I did find the musical very cheesy in parts (especially Susan's love interest Fred Gailey) however the show cannot help but lift your spirits and fill you with festive cheer. The Macy's parade and Christmas favourites such as Jingle Bells and Silent night were real crowd pleasers and for me Doris as the little girl who is older than her years was the real star of the show. Expect singing, flag waving, magic, Christmas trees, decorations, dancing, solo performances, live music, a touch of silliness, countless costume changes and even snow with a little treat at the end for the audience that I won't spoil for you. An over-passionate on-stage kiss, a few one liners and the very fact that they are questioning that Santa Claus isn't real mean that this is a show I would probably avoid with younger children. 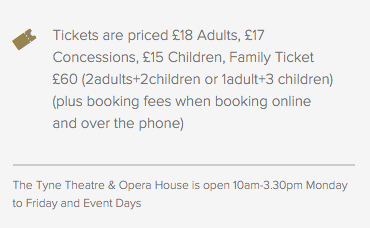 However I do think it is perfect for children aged 8 and over who love the theatre and definitely a good night out for groups of friends or couples. We left the theatre with cheesy smiles on our faces, singing Christmas songs back to the car park and definitely feeling as if Christmas had landed in Newcastle. 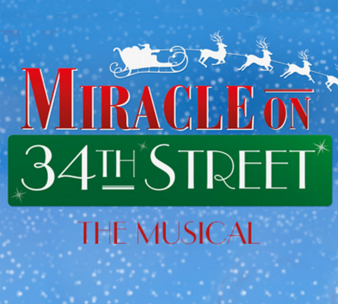 Miracle on 34th Street The Musical continues on Friday 13th at 7pm and Saturday 14th at 1pm and 5pm. On a side note, I think that tickets to the theatre always make a wonderful Christmas gift, especially for those who are difficult to buy for. With shows such as The Circus of Horrors, Ed Byrne, Madame Butterly, Sweeney Todd, Oliver, Avenue Q, Sarah Millican, Dirty Dancing, Footloose and The Dreamboys set to visit the theatre in 2016 and tickets available from just £9, there really is a show for all tastes and budgets. We'll be back at the Tyne Theatre & Opera House in December for their traditional panto and cannot wait to return. I love theTyne it's such a beautiful theatre! Shamefully I have never seen miracle on 34th street I think ill need it on my Christmas list! This sounds like the perfect show to get in the festive mood Sam... 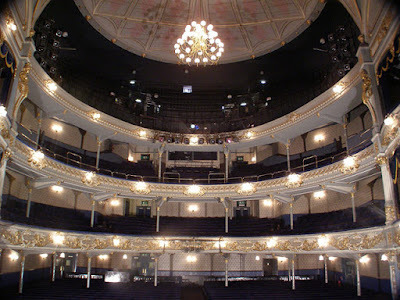 I've never been to the Tyne Theatre & Opera House but it looks stunning - I'll def be keeping a close eye on the listings.